Banana Springs is an all year round spring located at the Old Texas Downs station, East of Warmun (Turkey Creek) WA. The artist remembered as a young girl travelling with drays and horses to Old Texas Downs and collecting bananas off the Manager, Jack Kelly, who grew a plantation along the spring. They would then load up the drays with bananas and take them to Wyndham, approximately 170 kilometres away. In those days the township of Kununurra didn't exist. 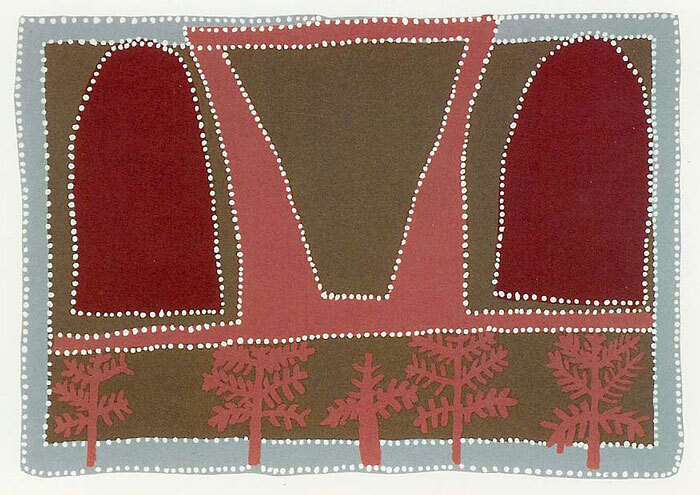 The Dreamtime story associated with the spring tells about an old Aboriginal man and his wife living there at the spring. When they died they turned into rocks and created a waterfall. The print depicts the husband as the red rock on the left hand side and his wife is to the right. The bananas are growing at the bottom. The pink areas are the waterfall run off.